With an all-new reduced weight design, the Tour Edition is for serious anglers who demand the best performance in a lightweight spinning reel. Features include a lightweight titanium crank handle, 12 hybrid polymer stainless steel PT bearings, super-durable titanium vacuum deposition finish, LMS line management system, MAGLOK continuous anti-reverse, improved TiMag titanium bail with magnetic trip, and a stacked ceramic front-adjustable drag. Free spare aluminum spool is included. "I've had the TE10PTI-B for a few months now and I'm completely happy with it. It's a lot lighter than the previous version and seems a lot smoother and more refined. I hauled in a six-pounder with this reel spooled with six-pound BPS XPS flourocarbon and I felt in control the entire time." "Best reels i ever used, I never seen a problem with a quantum reel ever in my 24 years of fishing with them.....100% Smooth 100% trouble free 100% the best Thx quantum"
"This reel has failed me for the last time. The line roller screw backs out on it and is impossible to get back in correctly. If you tighten it too much, the bail won't close all the way. If you tighten it and back it off a bit so the bail closes, the screw backs out again. I emailed quantum and they told me to put lock tite on it." "This reel is a great crankbait and shaky head fishing techniques. 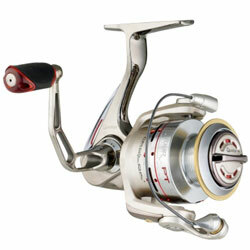 This reel has a smooth spinning action when you reel it in. The reel also allows you to swich the handle to reel with your left hand."